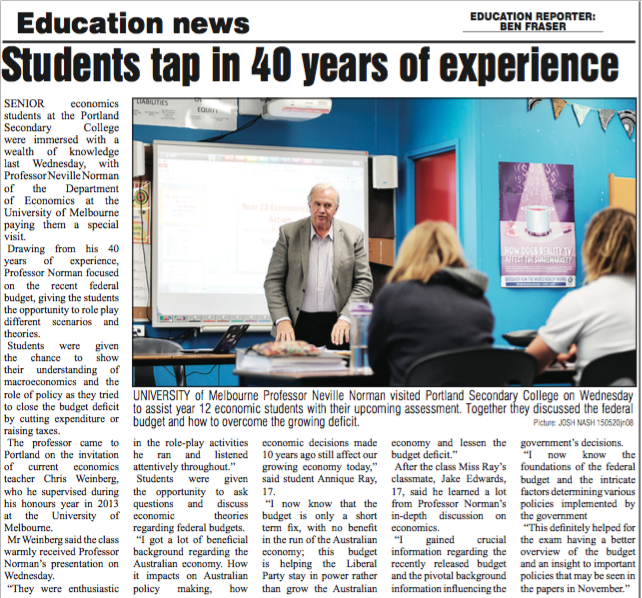 It was a great privilege, last week, to welcome a former lecturer of mine from my days as a Bachelor of Commerce (Honours) student, Neville Norman, to my Year 12 Economics class at Portland Secondary College. Thanks to the Portland Observer and Guardian for recapping Neville’s visit. In the article are some excellent reflections by students Jake Edwards and Annique Ray on how Neville’s workshop helped develop their understanding of the 2015 Federal Budget and the role it will play in the VCE Exam. In moving to southwest Victoria to complete the Teach For Australia program at Portland Secondary College, I’ve been blessed to immerse myself in country life and challenge myself to grow in an unfamiliar context, after a twenty-two year urban upbringing. I was given the opportunity to share these sentiments on ABC Statewide Drive on Monday 18 May in conversation with Nicole Chvastek. My reflections on relocating to Portland were part of a conversation about the increasingly mobile populations in regional and rural Australia.